This small gift book features 26 one-page devotionals on topics relevant to the young adult beginning life on their own for the first time. Some of the topics included are debt, overload, dating, emotions, and sin. The book measures 6.5" long X 5.75" wide. Perfect for the high school or college graduate. Provides directions for life's journey. - Publisher New graduates often face confusing signposts. Which path to take? 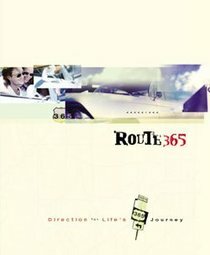 The Route 365 gift book steers them in the right direction. Inside this cool, contemporary package are practical, biblical meditations that address the opportunities and challenges young people face-work habits, friendships, financial choices, personal growth, and more. The relevant message is strengthened by full-color design that today's graduate can relate to. At only $4.99, it makes the perfect graduation gift or add-on-and it can be cross-promoted with the 365-day daily devotional journal of the same name. Material for both products is drawn from the Barbour book The Word on Life. New graduates often face confusing signposts. Which path to take? The Route 365 gift book steers them in the right direction. Inside this cool, contemporary package are practical, biblical meditations that address the opportunities and challenges young people face-work habits, friendships, financial choices, personal growth, and more. The relevant message is strengthened by full-color design that today's graduate can relate to. At only $4.99, it makes the perfect graduation gift or add-on-and it can be cross-promoted with the 365-day daily devotional journal of the same name. Material for both products is drawn from the Barbour book The Word on Life.